There are still plenty of wildflowers blooming in the Great Smoky Mountains National Park in August and September. 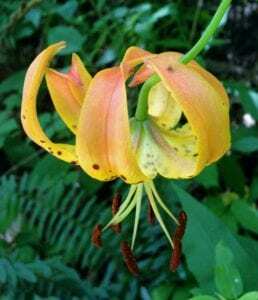 This Turk’s Cap Lily (pictured right) was photographed from Newfound Gap Road. It is typically found in moist woods, balds or trail side thickets from July through September. This spectacular lily can also be seen on Kanati Fork Trail. The Yellow-fringed Orchid (pictured below) can be seen on Cades Cove Loop Trail and Fork Ridge Trail. The blossoms range in color from bright yellow to deep orange. This delicate beauty also blooms from July through September.